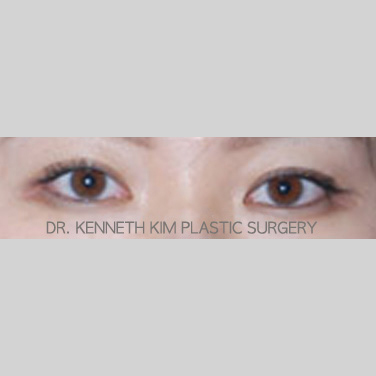 Many Korean patients come to consult at my Los Angeles plastic surgery practice due to an unsuccessful double eyelid surgery operation from the past. 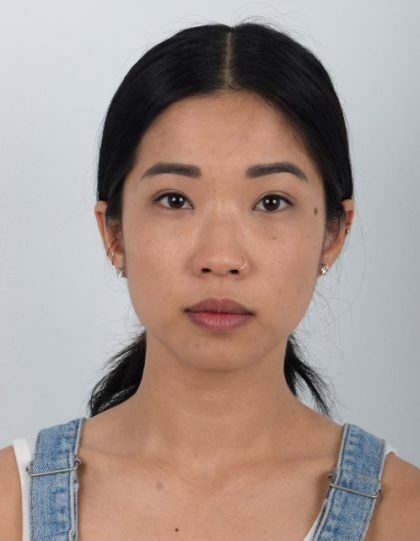 This has become a serious issue among Asian patients; many undergo surgery anticipating the best possible results, only to be dissatisfied with the way they look afterwards. Some of the most common cases for an eyelid revision are described below. 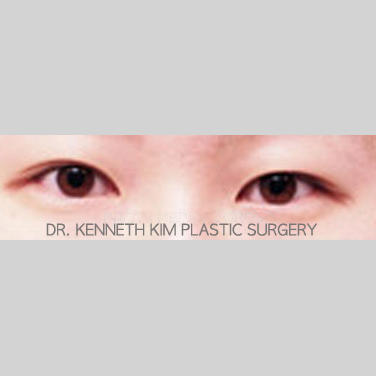 Ptosis or subclinical ptosis (i.e., no evidence of ptosis but results after double eyelid surgery) can also be an issue for patients who wish to undergo double eyelid surgery. When seeking ptosis correction, do your research to find a skillful and experienced surgeon. As ptosis correction is a challenging procedure, it is imperative that your surgeon has an expertise in the comprehensive anatomy of the eyes and eye surgeries. A high fold is a fold that has been set too high above the eye. The eye elevating muscle, which supports the burden of skin on the eyelid, is crucial to the successful formation of a relatively high crease (i.e. outfold). As such, a weak eye elevating muscle cannot support the burden created by such a high crease. Another reason that the eye cannot support a high fold is a condition called borderline ptosis. Borderline ptosis is a condition that some patients are born with, and transitions into a full-scale ptosis with age. Often times, this condition should be taken into account during consultation before the patient undergoes surgery. However, after surgery operations where this is not taken into account, the patient suffers the repercussions of a permanently swollen, puffy eyelid (also referred to as a “sausage” eyelid in South Korea). This overly heavy eyelid compresses down onto the eye, making the patient appear sleepy. A remedy to this case is to release the high fold and recreate the fold at a lower height. This issue is remedied by the creation of two planes around the formed scar tissue as a means to produce a buffer between the virgin skin (unscarred tissue) and the scarred tissue. This buffer prevents contact between the scar tissue from re-adhering to the virgin skin. Upon creating this buffer, the upper eyelid skin can be excised depending on how much it droops. Typically for younger patients, there is no need for this excision; however for older patients, who skin is less elastic, this upper eyelid skin excision is performed. Upon releasing the previous fold, either the suture or open technique can be applied to create the lower, more suitable fold. Depending on how deep into the skin the prior crease was, a specific technique is used. For a crease that was very deep, the open technique is used; whereas for a crease that was weak, the suture technique is used. After a high fold has been remedied, the patient appears more natural with lower creases that are proportional to the shape and size of the eye. A decreasing fold often results from two causes. The first cause is the patient’s fatty eyelid skin. A patient who has undergone a suture technique may notice a loosening fold due to the sutures’ inability to support the crease. The second cause may be that the sutures were not placed tightly enough to support the crease. Whichever the case, the way to solve this problem is to reapply the suture technique to the eyes. This can be done with or without the removal of the previous sutures. Upon revision of a loosening fold, the patient is able to experience a long-lasting fold that does not loosen over time. As mentioned, patients with a borderline ptosis condition experience issues after an operation that did not account for this matter. Those who underwent surgery in this condition eventually witness a full-scale ptosis, or a drooping upper eyelid. The drooping upper eyelid skin covers the crease, thereby making the eyes appear smaller and more crowded. The solution to this situation is to perform a ptosis repair (tighten the eye elevating muscles), and excise the excess skin such that it no longer droops over the crease. After this procedure, older patients instantly regain youth in their eyes, appearing larger and brighter. Upper eyelid scars from double eyelid surgery can result due to poor suturing, static fold formation, or misalignment of where the fixation is made relative to muscle direction. Scar revision is a relatively simple procedure that requires the scar to be excised and the eyelid fold to be recreated. This can occur when a surgery overcorrects a patient with ptosis resulting in the patient looking surprised or startled. Patients may experience overly enlarged eyes where their upper sclera shows (i.e., white aspect of eye is visible on top of the iris). Correction of this can be accomplished by massage or revision surgery. If caught early (within few weeks of surgery), this can be corrected by strengthening the eyelid muscle by means of a massage technique. If not caught in the early stages, retraction correction must be done surgically by reversing the ptosis correction and then creating a buffer with the patient’s own inherent scar tissue. This procedure is advanced, as ptosis revision was traditionally done by grafting the patient’s ear cartilages or mucosa inside the mouth to create a buffer. Many times, patients can experience heaviness of their eyelid when they have ptosis, the weakening of the eyelid elevating muscle. Patients that have undergone double eyelid surgery may also experience another form of heaviness due to puffiness (swelling) of their eyelid. 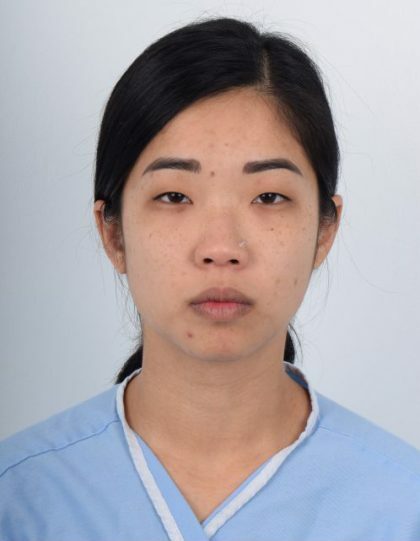 If the patient is experiencing heaviness of the eyelids as a result of ptosis, the surgeon must strengthen the eye muscle by performing ptosis correction. There are two types of puffiness that can result in heavy eyelids–fullness in the area between the lash line and the crease or puffiness above the crease up to the brow. Sausage – When fullness occurs between the lash line and the crease, it is referred to as “sausage”. When the patient’s face is viewed from the side, the “sausage” area will protrude under the crease, appearing unnatural and unattractive. The cause of “sausage” can be due to the spontaneous development of ptosis or induced ptosis, where a patient’s eye muscle develops intolerance to a high fold. 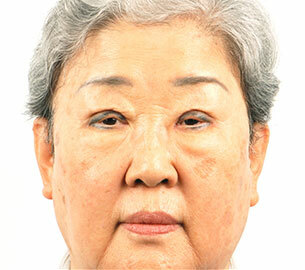 If this occurs due to spontaneous ptosis or induced ptosis, the heaviness can be alleviated by ptosis correction. If the heaviness occurs because the patient’s fold is too high, it can be corrected by lowering the fold. Crease to brow puffiness – Puffiness in the area between the fold and the brow can be corrected by removal of skin or with a brow lift. There are two types of brow lifts: a traditional brow lift, or a sub brow lift. A traditional brow lift (otherwise called forehead lift) involves lifting of the forehead and brow from or above the hairline and subsequently, the eyelid is lifted. A sub brow lift is done by excising a portion of skin immediately under the brow. Some individuals may require such brow lift when getting double eyelid surgery if their brow skin is too puffy or extremely thick. Patients may seek to alter the height/size of the upper eyelid fold after double eyelid surgery when they believe that their double eyelid fold is either too high or too low. Another aspect of the eyelid crease is the depth of the fold. Patients may seek revision surgery because their eyelid crease is too deep or too shallow. This detail of the eyelid fold may be subtle but important nonetheless, as a fold that is too deep can make a person appear harsh while a fold that is too shallow can give someone the appearance of lacking sharpness and clarity. The surgeon must have an expertise in eyelid surgeries to calibrate the depth of the crease by understanding the individual’s thickness of skin, fat, and muscle, and muscle strength, as these components may vary from person to person. A patient can seek revision surgery to change a high fold from their initial double eyelid surgery to a lower fold due to: the patient changing their mind, an inadvertent high fold as a result of a weak eye muscle (see Ptosis), or an inadvertent high fold as a result of surgeon fixing fold to the high aspect of the eye muscle rather than the lower aspect as the surgeon had intended. The method for correcting this complication can depend on the presence of excess eyelid skin and the cause of the high fold. Excess Skin – If the patient has excess skin (some signs of hooding), the surgeon simply corrects the high fold by excising excess skin and creating a newer fold at a lower aspect of the eyelid. No Excess Skin – When the patient does not have redundant or excess skin, the surgeon dissects the fold in two separate planes and releases the high fold. Additionally, a buffer (most of the time with fat) is placed on the upper eyelid and the skin is then reset to the lower aspect of the elevating muscle in order to prevent reattachment. If excess fat does not exist and cannot be mobilized by wide dissection of the eyelid, fat must be grafted from another area of the patient’s body. 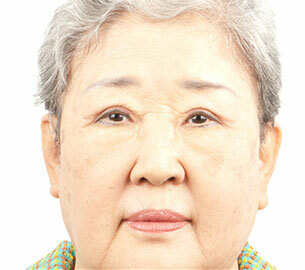 Furthermore, if the eyelid muscle is weak, ptosis correction must also be performed. A patient can seek to change a lower fold from their initial eyelid surgery to a higher fold due to: the patient changing their mind, a smaller fold incongruous to the shape of patient’s eye, or a decreased fold due to sagging skin. A low to high fold revision is easier than a high to low fold revision. With the low to high fold revision, the patient’s fold from the previous surgery becomes negligible as the higher fold becomes the dominant fold. A sharp, crisp crease is more appealing as well as desirable. A fold that is too shallow can occur when the surgeon fails to calibrate the fold properly, or due to loosening over time due to age. In addition, there is a higher chance of loosening if the patient has previously undergone the suture technique. In order to correct a crease that is too shallow, the fold must be reinforced with either the incisional technique, the suture technique, or 3D suture technique. A fold that is too strong can cause the crease to look static and unnatural. A static fold is when the fold does not change with eye movement (i.e., the fold should soften with eye closure and sharpen with eye opening). A deep fold typically results when the skin is attached to the eye elevating muscle too high (i.e., was not attached to a surgically created septo-levator complex) or when the skin is attached to the tarsus. In order to correct this problem, the surgeon must dissect and release the fold and place the new fold at an ideal anatomical location with adequate depth. There are various double eyelid revision techniques to correct different conditions. The duration of the surgery will depend on the condition of each patient. The surgery takes place under local anesthesia, with or without oral sedatives. The skin stitches will be removed 4-6 days after the surgery at our office. The critical swelling will subside in 1 week, and the remaining swelling will subside gradually within 8-12 weeks.